I've been watching baking shows for years now, and I am an amateur baker, doing cakes for friends' birthdays and the like. I often get jealous of the large workspaces, great tools, and prepared icings and fondants on series such as these, but I finally came to the realization of what I envy most: the team aspect. Much of the time, I bake and decorate alone, which takes a great deal more time than I always feel like it should, but I generally attribute that to the fact that I'm a perfectionist. Nope... I'm pretty sure the bigger problem is that I'm only one person. In this episode, the contestants began to get a feel for what the others think of them, and also how other team dynamics function. It was particularly interesting that Buddy allowed them to choose their own teams (I'm slightly suspicious of producer pressure there), though I am a bit sad over the team which got the boot this time... I think they could have had some very interesting future work to show as well. Rox & Kai, David & Elaine, Manny & Al: Elaine thinks candy factory, but they aren't utilizing enough cake and have to add in more. [good. I hate when designs ignore the fact that it's a cake first!] It could have used candy in more ways, as it didn't look like all 100 pounds was on there, and they're judged to be the middle-ground cake. Fred & Barry, Julie & Danielle, Jennifer & Bethany. Fred thinks a gumball machine with a big teddy bear would be a good idea, but when Fred and Barry are told to play to their strengths and do more sugarwork, they wind up not paying enough attention and the design doesn't get executed properly. [eh. kinda set-up to fail in that respect.] The purple team doesn't like the pink team's lollipop, so they pull it off... and Pink puts a confetti canon in its place. [both acts seems random and childish, happening without communication.] 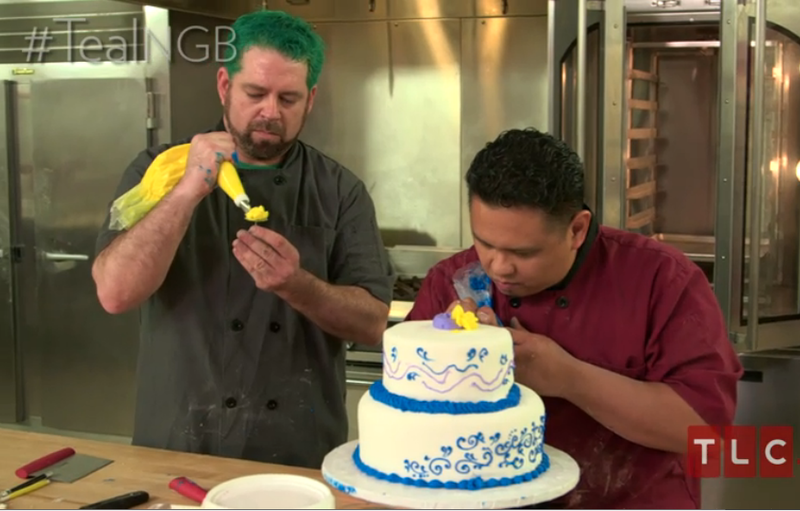 The execution is simple, and the gumball machine should have used more candy, so they are judged to be worst cake, and must face the Elimination Challenge. The Elimination Challenge: The bottom three teams must make a candybar in 30 minutes, using any ingredients in the pantry. Julie & Danielle go with a no-bake cookie bar. Jennifer & Bethany make a peanut butter bar that doesn't bake all the way through, so they cut it out of the pan differently.